In this series you are given a very deep experience of being walked through and guided along the path to enlightenment with an awakened consciousness opening you up to your increasing power as a “sensitive” or “empath”. 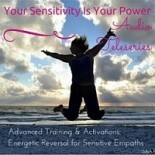 By using the term “Sensitives” it is meant to lovingly reference your own innate abilities to intuitively SENSE and perceive vibrations, frequencies and energies of those around you and NOT meant in the common derogatory way of “you cry too easily.” What this series offers is empowerment out of the hindrance of absorbing too much of others’ energy, and instead become strengthened and activated to finally step out in a joyous expression of your power. You’re then set up to step into the active, gentle force as the co-creator of your life and living. This is the nature of our times, as Dr. Alison has been known to say, yet it is this very product in which you are given the tools and the wisdom, the consciousness and the energy of this greatest evolutionary Shift in humanity’s history, on into this new era of our Spiritual Awakening. You will feel – as many of the original participants reported – Dr. Alison’s power as much as a teacher transmitting wisdom contained within programmed, activated consciousness, as you do the potent clearings and activations. This is quite an advanced product that had participants commenting on how much they’d gained (freedom, relief, release & joy) from the Instructional parts, as much as the Clearings & Activations. The powerhouse series is recommended for all who wish to really simply embody their Awakened Presence, and have ease with creating their lives as they desire them to show up, increasingly free of the old, perceived hindrances that the average person still seems to be entangled within. It will set you apart, if you allow it. The series is especially recommended for energy workers, healers and practitioners to have as a training product first and foremost to shift themselves so they may then better serve their clients. Yet it will also vastly elevate your span of knowledge & raise the consciousness for not only yourself, but through your shifted, Awakened and embodied Presence, all of humanity at the same time. You will also receive what the initial participants experienced and spoke of as “offering empaths relief” that includes release of the hidden belief of carrying a burden on behalf of humanity and transmuting that into it being their “job” to live in joy, with a fierce yet gentle and steady empowerment for their gifts.